This is an extraordinary production. And, the Royal Court run being completely sold out, we were lucky to see it yesterday. 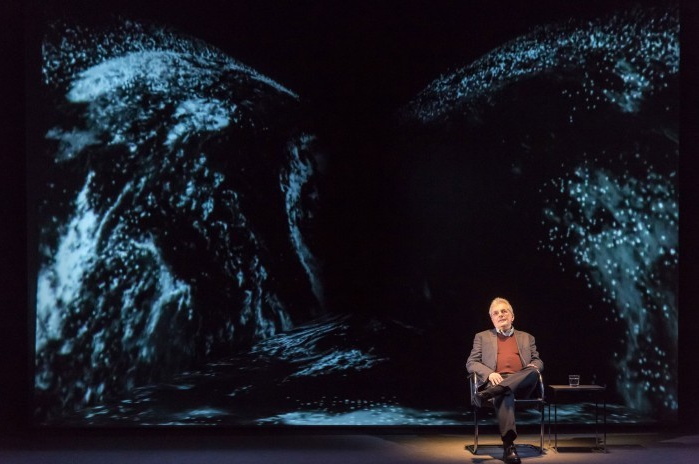 It is extraordinary because it is not presented by any sort of actor but by a top international scientist, and one who obviously believes that doing this – presenting climate science as clearly as he can to two London theatre audiences a day – is the most important thing he has to do at the moment. And as we read from the free handout that one of his many professional roles is Chairman of the Science Policy Advisory Committee of the European Space Agency, we could well imagine, on what was the day of maximum tension after their triumphant comet landing, Professor Rapley would rather have been much closer to the action . But onto the stage he walked, without the slightest showmanship, sat down, and talked quietly for 70 minutes about the situation that faces the world. Behind him, and perfectly synchronised with his words, were steadily-evolving images, graphs and diagrams on a huge, kaleidoscopic back-drop. The fact that these graphics were almost entirely monochrome made the occasional use of red extremely striking. The sound track was equally subtle; gently supporting the narrative and punctuating it with hanging silences while he took a sip from his water glass. In all it was a deceptively sophisticated telling of a story which is, of course, far too dramatic to require theatricality. To my mind it was perfectly judged, and absolutely convincing. Professor Rapley had been Director of the British Antarctic Survey and was particularly authoritative about the collapse of Antarctic Ice Shelves; now happening far more rapidly than ever expected. And as past Director of the Science Museum and Chairman of University College London’s Policy Commission on Communicating Climate Science he presented a masterly overview of all aspects of his subject. He described this year’s report from the Intergovernment Panel on Climate Change, with its unequivocal call for action, as the most audited document in history. One easily-understood implication of this report being that three quarters of known fossil fuel reserves must be left in the ground if humanity is to avoid the potentially disastrous consequences of a more than 2°C rise in global temperature over pre-industrial levels. We have already had 0.8°C of that. There were lots of young people in the audience, as well as older folks like us. But deniers were not at all in evidence. One day such people must realise that they have grandchildren too (Professor Rapley’s oldest will be the age he is now in 2071 – hence the title). Unfortunately, as things stand at the moment, that is going to be too late.